Bath time definitely doesn’t fall into “My Favorite Activity” for most dogs. In fact they try to avoid it at all cost. However, just the word “walk” usually gets the tail wagging, running in circles in anticipation, and waiting at the door for the great event. Well, that is the case for most dogs….but not Zeus the adorable stubborn Husky. Apparently Zeus has made up his mind, that his majesty, is ready for his bath to be drawn. 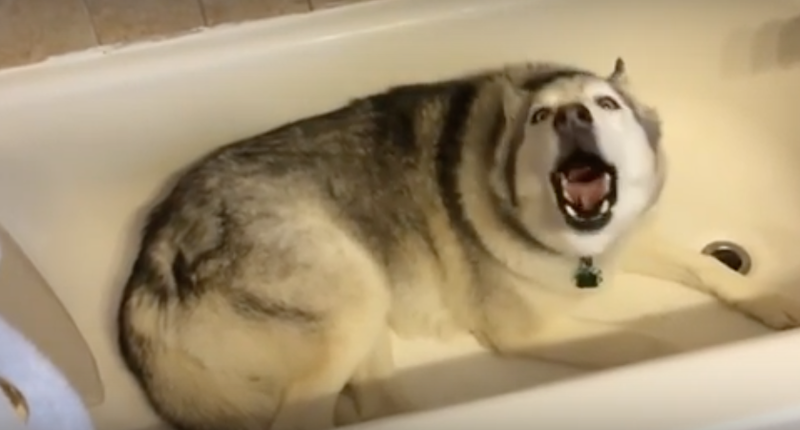 He has placed himself in the empty bathtub, and every time he is told it isn’t bath time, but time to for a walk…well you will see his hilarious reaction in the video below. Let’s just say that Zeus is like a big toddler, who practically sounds like he is talking, as he responds to his mom saying “Get out of the bathtub!” He knows it’s time for his walk, but his preference for a nice relaxing bath is something he is willing to fight for. Watch the laugh-out-loud footage to see who wins!